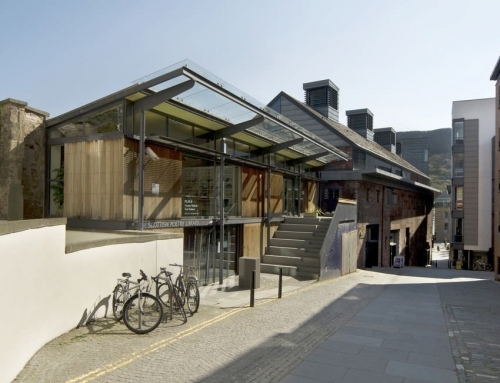 The Edinburgh Centre for Carbon Innovation is a world class interdisciplinary research and teaching facility focused on key climate related challenges facing society. 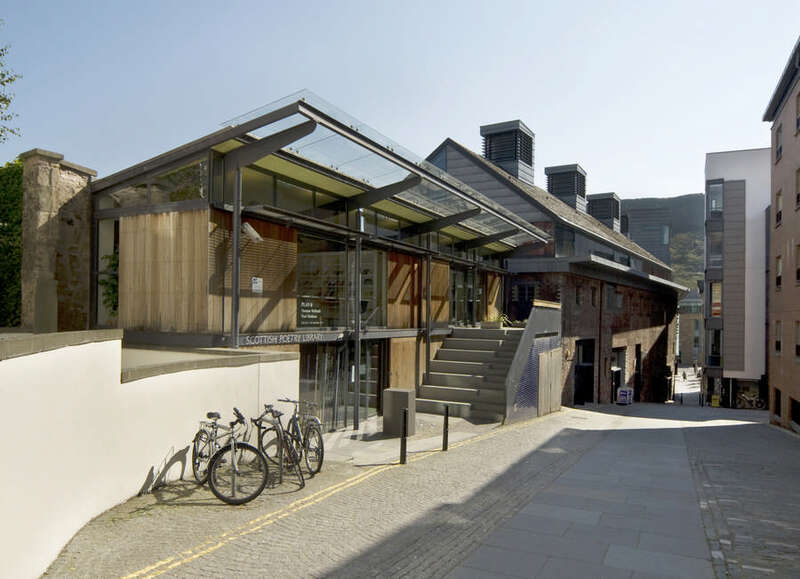 The ECCI will: bring together and direct high-quality research; address the significance of climate change at the science-society interface; inform political decision making; and establish Edinburgh as a leading university in the field. 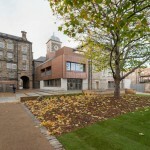 The ECCI involved a major alteration and extension of the Category B listed Old High School building, Infirmary Street. 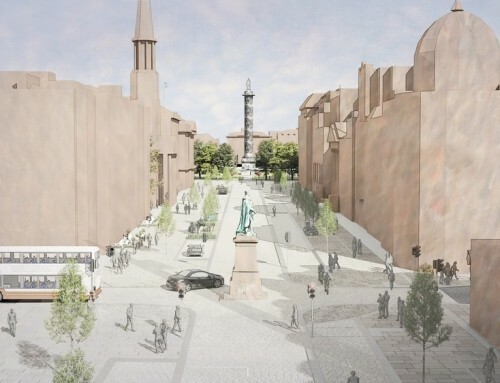 The brief included consideration of adjoining buildings, and proposals to reinvigorate the land within the High School Yards, to the boundary of Infirmary Street at the front (of the Old High School) and the enclosed space of Surgeon’s Square to the rear. 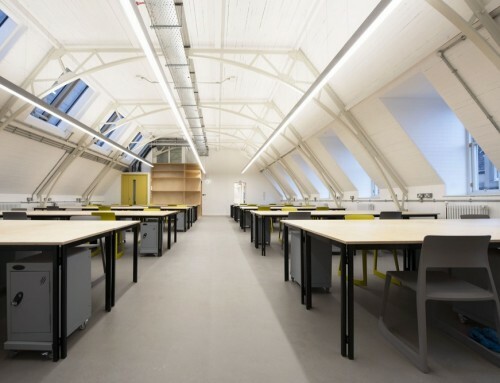 The accommodation includes refurbished teaching/seminar space, lecture/conferencing facilities; meeting rooms; staff offices; a Masters student hub; café and external landscaped areas. 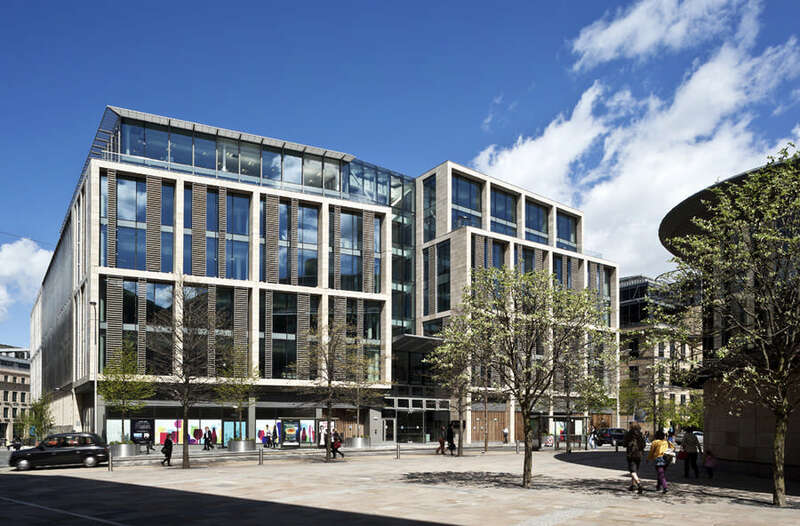 There is a very rich palimpsest of significant cultural buildings and uses revealed here; but what is also interesting is the important educational thread running through them, for High School Yards was founded here because of Blackfriars Monastery. High School Yards has always been a significant architectural site and has gone through many incarnations since its beginnings as Blackfriars Monastery (from 1230). In 1578 the first school building was built on the site to replace the educational function of the monastery. A larger Royal High School was then rebuilt in the same location in 1777 by Alexander Laing at the cost of £4000. Its pupils included Sir Walter Scott (his initials can be seen today amongst the 18th century graffiti on the wall by the entrance to the building). 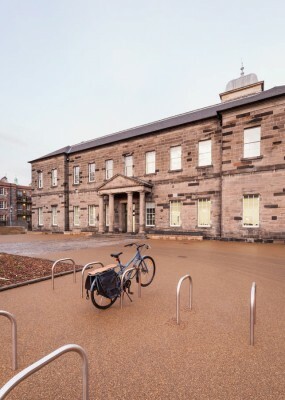 As great numbers of people moved out to the New Town in the early 19th century, the old school was closed and in 1832 the building re-opened as a Surgical Hospital, in which the University of Edinburgh held its Anatomy classes. 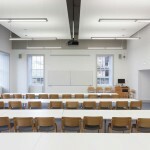 At this time a rear building, square in plan, was added containing the surgical lecture theatre. 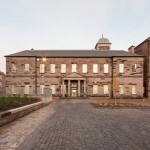 The Surgical Hospital then formed part of the Edinburgh Royal Infirmary, (at the time located on the site of Dovecot Studios on Infirmary Street), which had become short of space. By the latter stages of the 19th Century, the old hospitals were reaching the end of their useful life and throughout the 20th century the University acquired the Old High School building to house a number of different disciplines, including Engineering and Science, Geography and the Dental School. 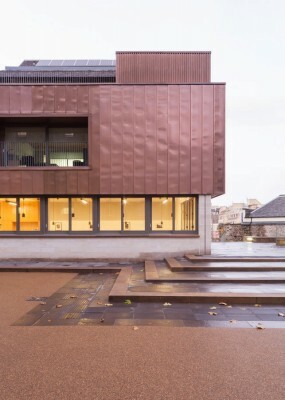 The repair and renewal of a significant building in the city centre is appropriate for the ECCI, but the further improvement of the sites permeability and engagement with the city is brings greater value to this historic site. To the front of the Old High School the existing school courtyard in recent years has been used largely as a car park, as is case within ‘Surgeon’s Square,’ to the back of the Old High School. Since the construction of the neighbouring 17th C. Surgeon’s Hall a series of buildings have gradually developed around the square, creating a rich architecture of varying forms and ages. 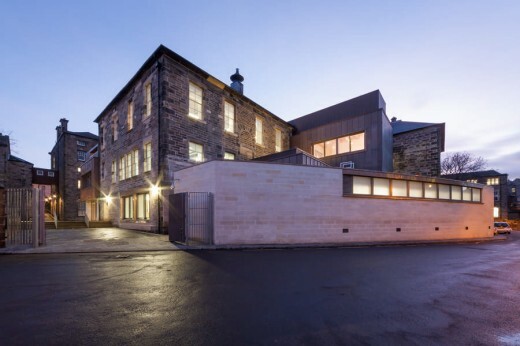 The renewal of the landscape to both the front and rear courtyards remove all but the accessible parking and the opportunity for renewed external spaces which have similarities to the culture of the internal spaces where interaction and communication is encouraged. 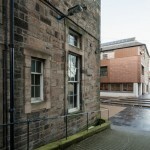 The Old High School now forms new connections with the neighbouring University buildings. 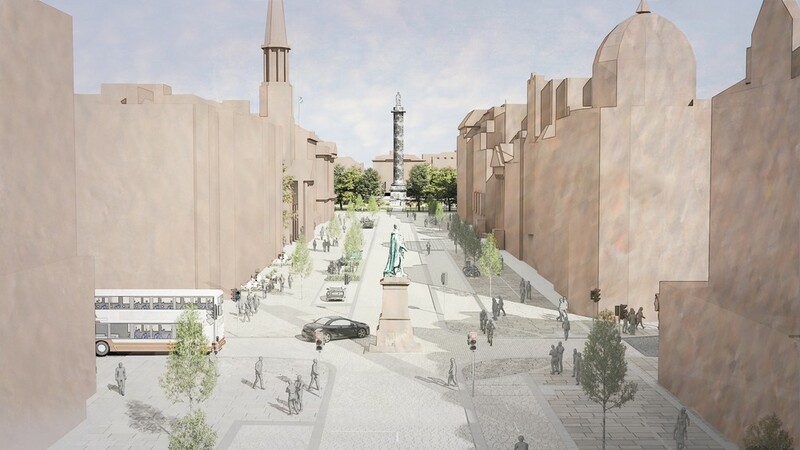 A pedestrian route through Surgeon’s Square is introduced by the reopening of a redundant entrance as well as the repair of an adjacent public access stair. 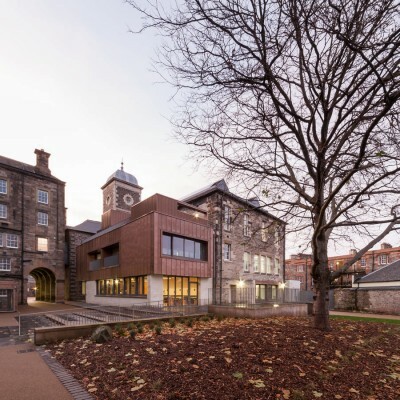 This reintroduces a significant link between the Old High School (ECCI), as well the University’s High School Yards campus, in the direction of the Cowgate, leading on to the University’s Holyrood Road sites, Waverley Station, the Parliament and Dynamic Earth. 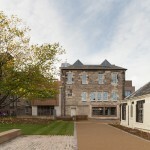 Where a pair of historic 18th C. buildings had been lost, to the west of the rear building to ECCI,(Royal Medical Society Hall and Anatomy Lecture Hall) a new Café building has been created, with meeting/ office spaces above, establishing ECCI’s physical connection with Surgeon’s Square and creating a social hub/ meeting space for the building and the wider campus. 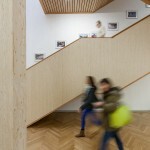 Similarly a generous opening is introduced to the lecture/ teaching space to reinforce this new connected courtyard. 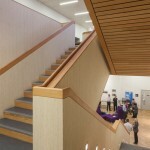 The existing linking stair between the older school building (front building) and the lecture hall building (rear building) we found to be unfriendly, confusing and not conducive to the kind of knowledge sharing demands of a Centre for Innovation. 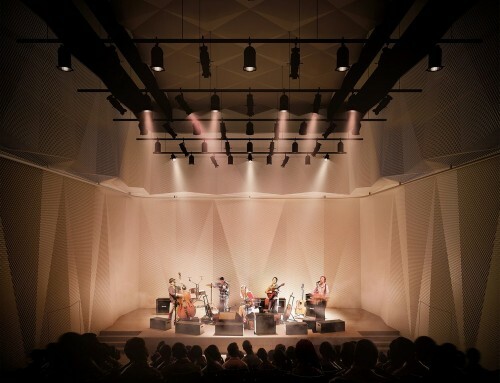 Due to the piecemeal fashion of the many changes that had occurred since 1777, the existing building as a whole was also lacking a sense of cohesion and its circulation was not clear. Other than the ground floor, all floor levels vary between one another (2 levels to the front and 3 levels to the rear). 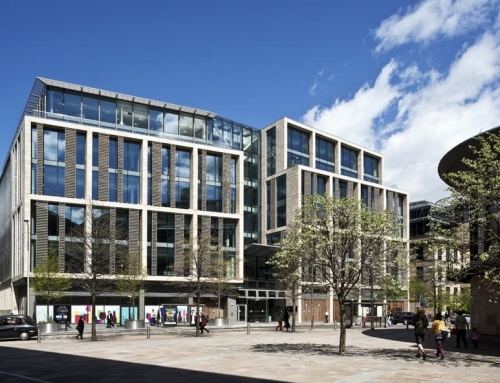 By removing the linking stair which connected the two significant front and rear buildings, it has been possible to create a generous central heart and circulation space. 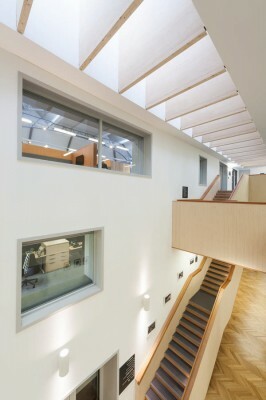 From this atrium, all accommodation spaces have a direct connection and their presence is visually legible. 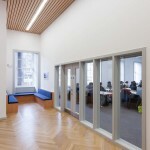 In response to the clients brief, this circulation space is a focus for interaction between a variety of building users (academic research/ staff/ student/ SME) and will provide informal break out space for small post graduate student groups, staff and businesses. 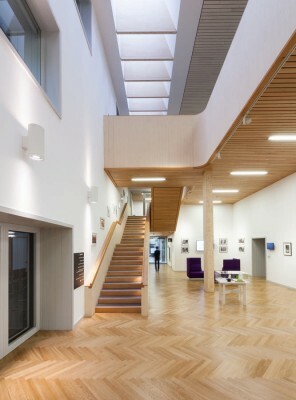 The ability for building users to communicate and exchange ideas is key to the client’s function and this central space responds to this. 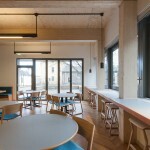 The accommodation spaces throughout the building were then reconfigured to provide well proportioned and suitably sized spaces which can be used as flexibly as possible, as office, teaching or meeting spaces. 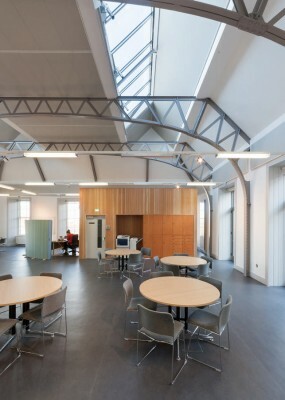 Specific decisions were made to provide a varying degrees of services for ventilation and IT within different spaces, such that the building as a whole can suit changes in the future (such as office to teaching) and also cater on a day to day basis for a variety of events such as conference, workshops, breakout, video conferencing, lectures etc.